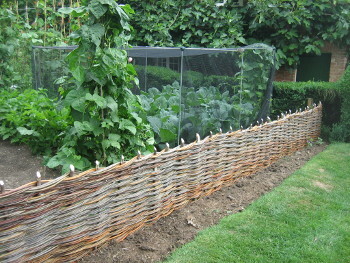 I like making willow fencing on site, it creates a feeling of continuity and produces a result that is more seamless than the alternative – bringing in pre-made panels. Of course making in situ isn’t always possible. Where perhaps the ground doesn’t lend itself to driven posts or where the fence needs to be set close to a wall or plants. In the latter circumstance, lack of space renders weaving impossible. But where such constraints don’t apply it can be marvellous. One added benefit of working in situ is that curves can be created; definitely not an option for prefabricated panels. 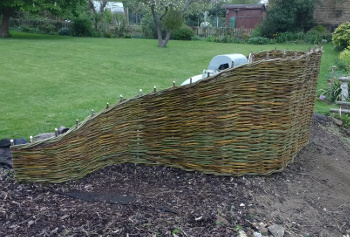 The curving screen (pictured) I made in a Bedfordshire garden during spring 2017 hid a rather large Calor gas tank located in a very prominent position in the garden. After much discussion with the customer, we settled on the creation of an asymmetric structure to provide a visual focus while new shrubs in front established.